Because of the higher cost of stainless steel, engineers and designers often overlook its many benefits. These benefits will often justify the initial investment in stainless steel as the material will likely provide the greatest value over the life of the project. The ability to self-heal with the presence of oxygen. Although chromium plays a significant role in stainless steel’s ability to self-heal, there are other elements at play, including molybdenum, nickel and nitrogen. There are more than 60 grades of stainless steel. Like every other metal available, stainless steel has its disadvantages. High initial cost, implications of handling the metal without high-quality equipment and difficulties in welding the metal rank high as the most common disadvantages. What makes stainless steel worth considering is the fact that the advantages far outweigh the disadvantages of working with this dependable metal. More and more organizations are choosing to remain aware of the impact that they are having on their communities at large. Over 50% of stainless steel comes from previously melted stainless steel scraps, reducing waste. 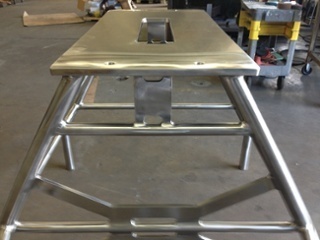 Working with stainless steel is only a challenge if your fabricator is working with outdated equipment. With the use of top-of-the-line, modern choices, stainless steel can be cut, welded and everything in-between with ease. Being corrosion resistant impacts the overall value and long-term investment of working with stainless steel. Chromium allows the steel to remain resistant to corrosion while different levels of alloy impact corrosion in different settings. For use in wet elements, lower grades of alloy work best. For use around acid and alkaline solutions, a higher alloy grade is a better option. Adding more value to the long-term investment of stainless steel is its resistance to fire and heat. Choosing high chromium and nickel-alloyed grades allow you to use stainless steel effectively in boilers, valves, feed water heaters and other heat exchangers. The long-term value of working with stainless steel far outweighs the initial investment that often turns the uninformed away. The life cycle cost should always be a part of the decision making. Choosing a maintenance-free product like stainless steel allows you to focus on a great process and product.